Kids are spending more time than ever on mobile devices. It’s unsurprising, but it’s still alarming, especially when you consider the eye-opening stats: Children 8 years and younger are reportedly spending an average of two hours and 19 minutes per day glued to their screens with roughly 30 percent of that time spent on mobile devices (tablets and smartphones). To boot, 42 percent of kids have their own tablet. That said, now more than ever, we need to get our kids outdoors and moving around. We get it; the thought of prying the devices from your kids’ grips might seem a difficult task, but approach them with any of these fun outdoor games and join them! We promise, they’ll have such a blast, they won’t even miss the iPhone. More: So Your Kid Wants a Cellphone: How Young Is Too Young? 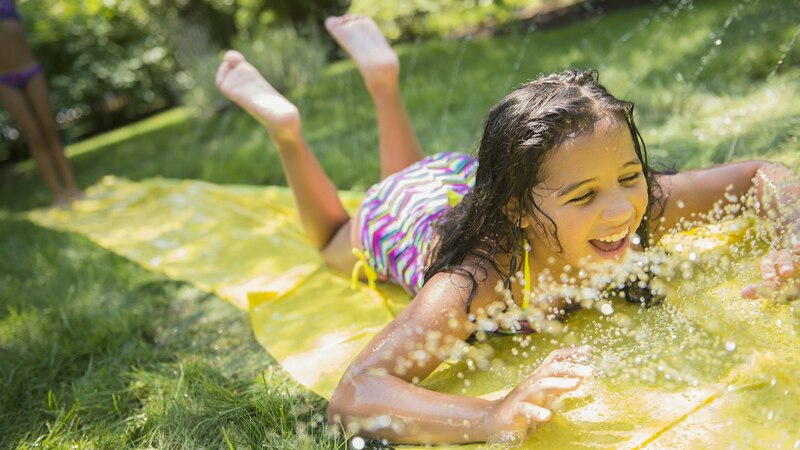 Make your own Slip ‘N Slide by laying out a tarp, spraying it down with water, then letting the hose continue to run on top of the slide. Take turns running across your lawn, then sliding across the tarp for a slippery, exciting game. Best played after the sun goes down, flashlight tag is the perfect outdoor game for late-night birthday or block parties. One player is designated “it” and is given a flashlight. The other players hide. When the person who is “it” finds a hidden player, they shine the light on the hider and the hider then becomes it. The original “it” then hides, and the game continues. Give each player a plastic cup filled with water. Start spinning a large jump rope. One at a time, each child must attempt to enter the rope and jump three times, all while spilling as little water as possible. The child with the most water left in his or her cup wins the game. Fill up a large trash can with water and place two empty trash cans about 40 feet away. Split kids into two teams and give each team an empty milk carton with 10 to 12 holes in the bottom. When you say “go,” the first player from each team fills their carton with water, then places it on their head while they walk or run to their team’s empty trash can. They empty the remaining water into the trash can, then run back, passing the carton to the next player. The first team to fill its trash can with water wins the game. If you have a sizable group of kids, playing sticks and stones will make them laugh while also tiring them out. Split the kids into two teams — the sticks and the stones. Line them up facing one another. Designate an area roughly 30 feet behind each team as that teams’ safe zone. To start the game, yell out, “Sticks!” or “Stones!” The team you call on must begin chasing the opposing team, which begins racing toward its safe zone. Any tagged players must switch teams, and the two new teams line up to play again. The team to bring all the players to its side wins the game. Split the kids into two teams. Each team gets two shoeboxes. Tape the lids onto the shoe boxes and cut an “I” shape into the top of the box, with a 4-inch slit and two 1-inch slits. Have the first player from each team slip her feet into the shoeboxes. When you say, “Go!” the players wearing the shoeboxes have to run from the starting line to a designated spot, then back again. Players pass the shoeboxes to their waiting teammates, and the relay continues until all the players have participated and a winning team is crowned. Set up a simple obstacle course in your yard and let all the kids examine the course. One at a time, blindfold the kids and let them work their way through the obstacle course. The child to make it through the fastest wins the game. If your kids love sports and want to play catch with a twist, introduce them to the game of 500. Give one child a football and have him stand about 20 feet in front of the remaining children. The child with the ball throws it up into the air toward the waiting players while calling out a number between 50 and 500. The player to catch the ball earns the number of points called, but if they drop the ball, they lose those points. The first player to accumulate 500 points becomes the next thrower. A version of this article was originally published in April 2011.